Smaller than anticipated, but looks great with everything in my living room. The colors are pretty accurate. Overall, would recommend. Add an artistic touch to a large wall with this hand-painted art from Strick & Bolton. 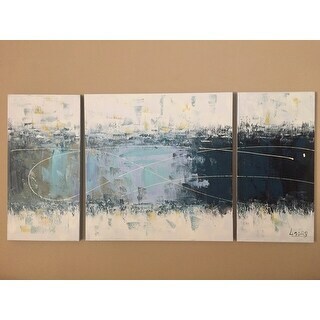 This three-piece set, entitled 'Wake Up' features an abstract painting in vibrant shades of blue and black on an off-white background. The gallery-wrapped canvas is ready to hang and the minimalist style is ideal for modern homes. Is a little different from the display picture that shows more yellow and blues but the color in real life doesn't have a lot of yellow and it looks like imitation of the online picture . The real size when you put the three together is 64x29 if you leave a 3 inches in between each piece. It looks cheaper in person than the picture but the look it's ok.
We hung this above our fireplace and it looks awesome. We spaced them an inch and a half apart and it's great. I get so many compliments on this. It is NOT a print, it's actual canvas with 3d paint marks. It looks awesome. This painting is absolutely beautiful! It is even more gorgeous in person. 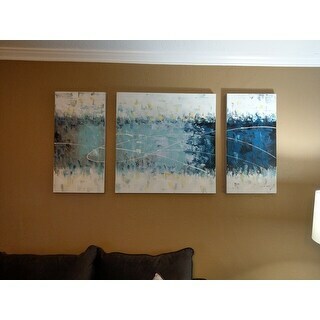 Overstock shipped quickly, and the canvases arrived undamaged. The canvas itself is wrapped nicely. Couple of things: -The smell. Yes, as previous reviewers have stated - as soon as you unwrap the plastic that these are shipped in, there is a VERY strong smell. It dissipates within a few days, but there is definitely a strong paint odor there. -The sides of the canvas are painted a light gray which I personally love! Absolutely makes a difference to the look of the paintings as opposed to white sides. -The lighter blue you see in the photo has an overlay of what I would call aqua. It's certainly not a turquoise as some people have stated, but it is also definitely not totally blue. It flows perfectly with the painting in my opinion, but do be aware of that. -The painting I received is lighter than what appears in the photo online, but I love it. I uploaded a photo that shows exactly the colors of the paintings. -This is an actual painting, not a print. It has a bunch of texture on it as a normal painting would. It looks very classy, and much more expensive than it costs! I 100% absolutely recommend! We LOVE it! Also - we placed each canvas about 3" apart in this photo. This canvas is made with quality, looks like it was hand painted on the canvas. Loved this piece online, worked perfectly with our new living room color scheme. It's beautiful in real life, too, but the middle panel is shades of lighter blue than the picture shows. Not a big deal, we're still reat enjoying it, but just be aware before purchasing. 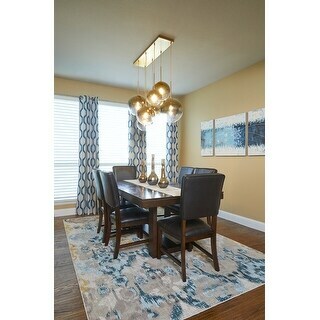 I knew that this art would match the peacock blue curtains that I bought for my new home and even though I did not know where I would hang it at the time of ordering, I bought it anyway. It looks exactly like the picture and I am very pleased with the "pop" of color, seeing it in person. It looks great and was easy to hang! the colors are exactly like it show, just paint my wall spa grey and my furniture is beige . so it has all the colors that I was looking for. It's not exactly the same, but close. The colors are good. There is a big glob of white paint on one section of the artwork that is an obvious mistake. The white line that connects the 3 panels is different. Also, it is signed in the lower right-hand corner, so I am limited to displaying it one way instead of the way it is displayed in the online picture. 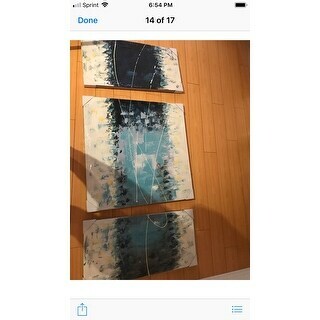 The blue in the art piece we received is lighter than suggested in the pictures. The key reason for the 1 star is the smell. I took it out of the bubble wrap and let it “air out” in our garage for a week but the smell is still there. Not sure we’re going to hang it. Smells like cheap paint and chemicals. Love the paint color scheme! Only criticism I have is that the sides are not perfectly aligned or flushed to the middle painting. However, I highly recommend this to people who wants to decorate their living space! Looks great above the fireplace in our pool table room. Great pop of color since the felt on the pool table s also blue. Breaks up the grey and white color of the walls and doors. Only reason I didn’t give a five star cause when unpacked the paintings had a strong odor that lasted a few days. Absolutely changed the entire "feel" of the room and made it modern, clean, and streamlined! To the negative side, the main painting had a broken wood brace in the rear, but I drove a screw in to repair it before hanging and all was well. Great size that filled the majority of the wall. The quality is great and not cheap looking. I would definitely recommend this product for those looking for a large painting. Very true to the online representation! Perfect size for quite a big wall as well. Love it! 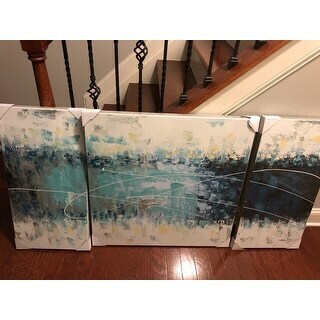 This canvas set is great for a big space and the quality is very good. The colors are very rich and go well with my accent wall that is blue. It has texture, it's not just a flat canvas. I love it. Its a very nice piece of art but definitely not high end! Its nice. Such a cool painting! Really modernizes the space. Looks exactly like photo and the colors are vibrant. Definitely a centerpiece for any room and the colors really pop! "What is the actual length and height in centimeters?" The actual length in centimeters is 150 cm, the actual height is 75 cm. "Are the darker colors in this product navy blue or black? Is there any grey colors in it?Thanks!" Yes, the darker colors in this product are navy blue. Yes, there are grey colors in it. Hope it helps. "Does this color take on a grey color. I don't have grey in my room. Was wondering if it will look good with tan and dark brown floors"
This is a neutral off-white color that will match all colors. It depends on your preference. Just as it's display on the site is it exact how it looks. My walls are a light gray and I have dark brown wood floors and chocolate sofa and the paintings compliments and enhance my sofa. "Is hardware to hang the canvas included?" No hardware is included, but you could use 3M command strips to hang them instead. "How much does each canvas weigh?" The shipping weight is approximately 9 lbs. Each canvas weighs about 2.2 lbs, 2.2 lbs and 4.4 lbs. "Does the art work come wrapped, and frames to be assembled as I want to take overseas?" These canvas prints come fully assembled, all you need to do is hang! They are not wrapped individually, but they are packaged pretty tight with hardly any room for moving around or possible damage. Yes, the art work comes wrapped, and frames to be assembled. Yes. It was wrapped securely with foam inserts. No assembly was required. It is three pieces. Just beautiful. You may have to secure it at the back with 3M, but that won't cause any damage. "Can this be hung vertically with the small panels on top and bottom rather than side by side?" No I don't think it would look good as the three pieces are a continuation of a pattern it's a triptic. I'm an InteriorDesigner so you have my professional opinion. If you are saying to basically turn the entire painting, vertically and keep the continuation, then it would be ok.. The only issue you may have is having to add hanging hooks to accommodate the new direction. When I hung it, I believe it only had one hook to hang it horizontally. I hope this helps! 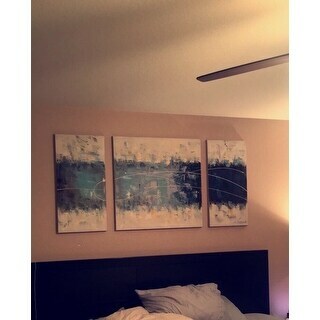 The painting is very nice. There is a signature on the bottom right of the third panel. If it's rotated to hang vertically the signature would look strange on its side.